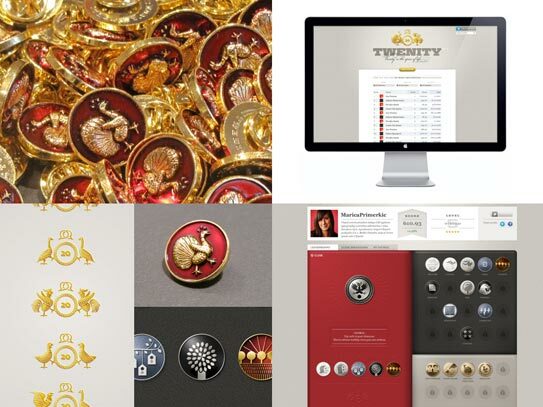 Twenity is an exciting new way to discover your social capital. Unlike similar services, that are built mostly around authority measuring, Twenity is first of all, a game. A Twitter based adventure, that allows players to go through different levels, unlock achievements (badges), solve challenges and compete with their friends. 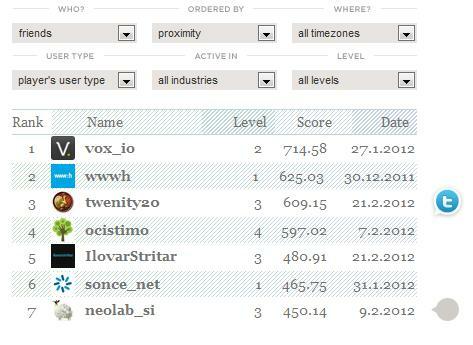 Twenity is currently in beta, since we are polishing the calculation and observing the performance. We are also working on new features, e.g. the compare module should be available in a few weeks. Nevertheless, there are already plenty of things for players to do, from getting a different insight into their Twitter profile, to observing what kind of impact their Twitter activities have. As you calculate yourself a few times, Twenity will guide you through different levels and award you with different badges. You will be able to see how your friends (people you follow) perform, who are the people you are catching-up on, and those that are beathing down your neck. You can become a player by clicking Analyze me. There are two major components in Twenity. 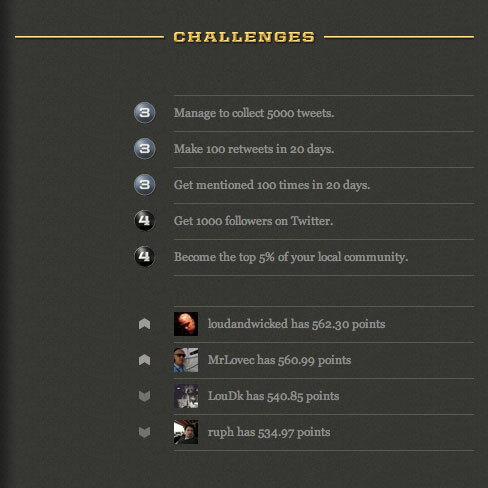 The score, which is based on information about your followers, tweets and lists, and the adventure component, which is portrayed by the level you are in and the achievements you have unlocked. 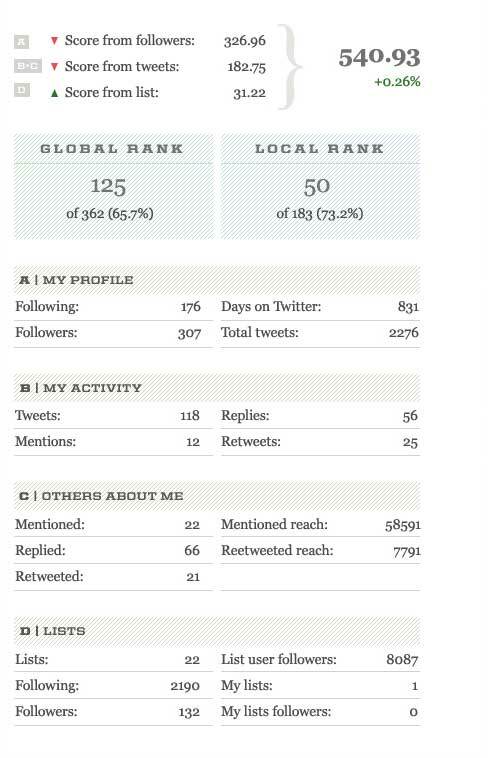 Different types of Twitter users will get different badges, and those that are more influential, will get a higher score. You can also use Twenity to discover and get discovered by others users similar to you, which was one of our priorities – help Twitterers to find each other. By adding yourself to various lists that determine your user type and your (two) industries, you will be more exposed for discovery. The timezone, which allows you to play in a local league, is currently taken from your Twitter profile, so you can set it there. At one point, we will probably be introducing localised versions of Twenity. There are already more than 700 players enjoying Twenity. Measuring your online social capital shouldn't be so serious and frustrating, it should be fun, and that's what we were aiming at. In a similar vibe, we've also introduced the provoking »Vanity is the spice of life« slogan, to make sure you wouldn't get over-obsessed with the score we calculate. 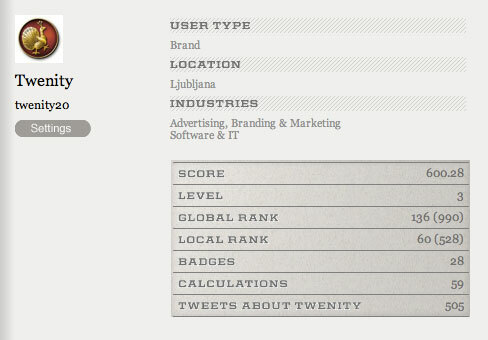 Twenity is a game that helps you discover your social capital while competing with your friends. This real-life adventure enables you to play without the need to actually do anything. Now go play and let us know if you like it.